Radiant Orchid!! A new year and new color trend to add to your beauty and fashion collections!! Pantone states, “Radiant Orchid is an enchanting harmony of fuchsia, purple and pink undertones, Radiant Orchid inspires confidence and emanates great joy, love and health. It is a captivating purple, one that draws you in with its beguiling charm.” Visit Pantone’s website for more information behind the inspiration of this years color and about Pantone the company! I am really excited about this color because I LOVE this color! I can’t wait to see how the beauty and fashion industry plays on this color this coming spring!! Last year I didn’t hop of the emerald trend as much as I will with Radiant orchid. I did buy same nail color, Sephora trio and accessories, however….I guess the only green I really like is the green the goes inside my wallet, lol!! 1. What are your plans when it comes to rocking this trend went it comes to makeup? 2. What are your plans when it comes to rocking this trend through fashion? Hey beauties!! Memorial day weekend is just around the corner and I know many of you are planning to have fun with your friends and family, right? Many of you will be out shopping in the sun, hitting the waves at your local beaches looking like sun goddesses or at your local park having some fun over bar-b-que and games. Well…with all of the fun celebrating these are my top 10 must haves in order to have you looking great and protecting your youth at the same time! My first must have is a must!! A high performing sunscreen that will protect your beautiful skin from premature aging and hyperpigmentation (the dreadful brown spots). Shiseido’s Ultimate Sun Protection Lotion Broad Spectrum SPF 50 For Face/Body, $39 is perfect for those of you that are going to be spending time outdoors in the sun. I love this sunscreen due to the light weight texture and the fact that this sunscreen is sand-and perspiration-proof along with being water-resistant for you beauties that love to hit the waves at your local beach or pool. For those of you that still crave to have a smooth and flawless complexion without the weight of a traditional foundation then this tinted moisturizer is perfect! NARS Pure Radiant Tinted Moisturizer Broad Spectrum SPF 30 Seychelles, $42 : In addition to the sun protection you will gain from this tinted moisturizer you will gain an radiant glow. Even though it is hot outside the sun can still dry out our kissable lips and burn them too! Which is why Fresh Sugar Lip Treatment SPF 15 Sugar, $22.50 made my list. Ever since I have received this as my Beauty Insider birthday gift from Sephora this has been a staple in my bag. It is non sticky and keeps my lips smooth while protecting them from getting burned from the sun! Water!! Yes I said it WATER!! You need to stay hydrated!! Water is good for your health and will help avoid heat exhaustion. The other great benefit to drinking water is that it will keep your skin-cells plumped and supple resulting in smooth and radiant skin! Keeping a water bottle close like this Brita Hard Sided Water Filter Bottle, $19.99 is a must. I like the fact that it has a filter attach for worry free refilling at the beach or shopping center that has a public water fountain. Must have a fun and bright flowy maxi dress this summer. They are easy to throw on and style up and down with simple accessories!! They are also a nice item to take to the beach because they are so easy to cover up after hitting the waves!! I really love this Bar III Dress, Sleeveless Halter Keyhole A-Line Maxi dress, $59. This dress is easy and fun!! I love the price too and it’s from one of my favorites store, Macy’s!! Sunglasses!! Sunglasses are very fashionable, and they are great for protecting your youth!! They protect your eye sights and help aid in reducing the chances for premature crows feet around the eyes (wrinkles, don’t want them!) I love these Michael Kors Sunglasses, M2477S KARMEN, $136 !! Simple and classic aviators are so fab, and did I mentioned that I am Michael Kors Obsessed, lol!! A summer signature scent..My favorite from last summer was Ralph Lauren Big Pony 2, $55. and it will be my main staple this summer too. It is a beautiful floral that is playful and fun on bright summer days!! I got so many compliments on it that I will wear it again this summer. I hope that don’t discontinue this one anytime soon!! If you are doing lots of walking shopping or at the beach you will definitely want some comfortable sandals. I like these DV by Dolce Vita Shoes, Denny Flat Sandals,$69. These sandals are simple, stylish and will keep your feet happy during your fun shopping or beach excursion. If you are going to the pool or beach you must have a fun and bright swimsuit!! For me bikini’s are a thing of the past..(Child stretched me out and now I need a tummy tuck, lol)So that is why I am loving this Hula Honey Swimsuit, Halter Crochet Tankini Top Women’s Swimsuit, $28. I love the texture and color!! Now ladies.. A tote is a must.. If you live in the Austin area you know the bag ordinance is in effective what means we really need to have a tote that fits all, right! That is why this MICHAEL Michael Kors ‘Medium Travel’ Tote. $278 is perfect!! You can fit swimwear, new finds from shopping and in on spot and if you have kids you can fit there things too!! Those are my top tens for Memorial day weekend. Do you have any top must haves of your own?? I would love to know! Please let some comments below and share with us your must have for summer fun in the sun!! Until next time have a fab day!! Today I was just feeling boho chic. I wanted to wear something comfortable, feminine and flowy in this hot Texas weather. This outfit also had to be easy to move in since I was out with my guys exploring. Ok. . . I can’t believe I am doing this, but I decided to post my first official outfit of the day. I lot of my youtube subscribers to my channel NHOP76 have been requesting fashion hauls and outfits of the day from myself. At first I will be honest, I did not want to post pictures of myself showing outfits that I like to wear because I am not at the weight or size I want to be at right now in my life. 6 years ago I lost of 65 pounds and got down to a beautiful size 8/10 and I would be in heaven in that size now in order to posts outfits of the day. Right now I am a size 14 and currently working on losing 30 pounds, so as I begin to start posting my outfits of the day you will also get a chance to see me melt away the pounds in new outfits! A special thanks goes out to my hubby who took the photos of me while we were out celebrating Father’s day. We took our son to Mt. Bonnell here in central Texas where the views were just so beautiful from the top of this mountain. We also went to the state capitol of Texas and learn a little history about the state we live in. So divas, stayed tuned. For now my future outfits of the day will be posted here onto my blog until we get used to taking pictures and videos out on location. Once we get that down I will start posting some live in action outfits of the day on my channel on youtube. In the meantime, I would love your feedback on this first outfit of the day by leaving your comments below. Hey all, I almost forgot to share with you all this beautiful orange/coral nail polish I picked up with my MAC “To The Beach” Haul in June. For all of my chameleons that love a fiery orange nail polish, this one is for you. Surprisingly this is my first ever MAC nail polish purchase ever and I have to say this one was not as watery as people had describe on youtube and other blogs. I guess it depends on the color and pigmentation of each shade. The color I picked up is called Scorcher and it is definitely that. A perfect color for the nails and extra gorgeous for the toenails too! I only had to apply 2 coats of the polish and it was beautiful. As far as the wear of the polish, it last about 2-3 days. Mind you, I am a mom so I cook, clean and work so my nails take a beating, lol. However, overall I was very satisfied with the color and I am glad that I added it to my growing nail polish collection. Hummm. . . Collection maybe I will do a collection blog or video! If you would like to see a collection post or video please leave a comment below. Until the next NOTD, stay fabulous! Every once in a while I will have a lust for something extra special. . . Okay most of the time, hahaha. Well, late last night I was browsing the web through many retailers looking for everything from the new arrivals of fall fashion such as shoes, handbags and makeup too! I guess I was in need of retail therapy. Well, I landed on Nordstrom.com and came across this gorgeous, GORGEOUS piece of eye candy. What graced my eyes was this beautiful Studded Foldover Tote by Be & D. I was thinking, Be & D? I was introduced to Be & D by my youtube buddy Toni Duclottni while watching one of her videos on her youtube channel House of Haute and from then I was in love with their line of handbags. This particular tote By B & D is so hot!! 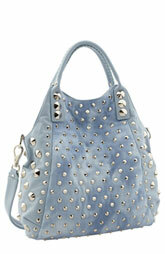 I love the mix of blue leather with the denim and to top that off I LOVE the studding all over this bag. The studding gives this bag that “bling bling” appeal to me. I can just imagine the many ways this bag can be worn during the season. Denim in a cloudy wash combines with supple leather to comprise a fold-over tote in an extended, vertical silhouette. Conical studs lend a modern update to the look, while whip stitching details the rolled handle for a subtle finishing touch. Fit: Dimensions: 15″W x 16″H x 4″D. (Measures large. )Strap drop: 5″.Shoulder strap drop: 16″. It has been a long time since I have done a MAC collection haul since the sugar sweet collection came out! I love some of the MAC collections that they create. I feel that they put a long of artistry into each collection which drives me to got try them out. The latest collection from, To The Beach”, is perfect to jump start the summer. What inspired me to go out and purchase some of the collection was this beautiful face chart for the look called Temperature rising. The MAC Bronzing Powder is in shade: Bronze, I just needed a darker bronzer for summer since my skin is a bit darker from being outdoors. I like this shade and recommend it is you are a NC42 which is my shade in most of MAC’s foundations. MAC eye shadows: 1 is from the MAC ‘To the Beach’ Eyeshadow which is called firecracker. It is a veluxe pearl that is softly pigmented with a orange/gold tone, very pretty. I want to purchase the sand and sun eyeshadow, but that one was sold out online and in store, so the MAC lady recommend to purchase the soft brown matte shadow that was pretty close to the collection color. The other two colors I picked up was ORB and Brown Script. I did not purchase the blue eyeliner because I have one in my makeup collection by Urban Decay that is pretty color. MAC Paint Pot : Painterly. I swear everyone on youtube uses this paint for a base, so I guess I am too, lol. But this paint pot is AWESOME!! I does not crease and I have been using this one all weekend long! Love it!! MAC ‘To the Beach’ Nail Lacquer : Scorcher. I love a hot orange in the summer time and this one was perfect for my short and chic nails. MAC 217 Blending Brush : I wanted another blending brush that was not as fluffy as my 224 brush. So, I will be using that in newer tutorials too! Hey all, today I would like to share with all a new brand of makeup that I have been working with and playing with for the past 5 months now. I discovered Raving Beauty Cosmetics on youtube back in 09. What intrigued me about Raving Beauty Cosmetics is the fact that the company is a small beauty business that offers mineral makeup for those with sensitive skin without the hefty price tag. Now you all know me I love my department store brands so much!! However, it can become pretty costly after a while of collecting it, right? That is why I decided try out Raving beauty cosmetics. I love playing with color especially when it comes to the eyes and when it comes to changing up the look according to the trends of the season eyeshadow can become costly especially in this day and age, so I thought let gives this a try. After trying I was so amazed with the quality of the shadows and the price. . . $5.00 per jar of shadow. As a result, I wanted to share this wonderful product to all of my viewers on youtube that watch my tutorials, because I was sure that they would like to create looks for whatever the occasion is without breaking the bank.